Fascia's & Guttering - J Norman & Sons Property Services Norwich & Suburbs. Leaking gutter? outside of your home needs sprucing up? Whatever the reason, we can replace,repair or clean fascia’s and guttering. With a large range of styles and colours to choose from we can replace like for like or provide a completely new look for the outside of your home. We will provide our usual high standards of workmanship, ensuring that all work is sound and without leaks, ensuring your home remains weather proof and attractive. Why not contact us for a no obligation quote or discuss your requirements in more detail. We may be able to just replace a section of guttering or fascia rather than the whole thing, we are trades people not sales people. We will of course dispose of any old fascia or guttering and ensure that your new weather protection is the only sign that we were ever there! Leaves and moss are contantly gathering in gutters. We can clear them for you. We can repair most leaking gutters for a fraction of the cost of replacements. We can repair most wooden fascia / barge boards and repaint to match. 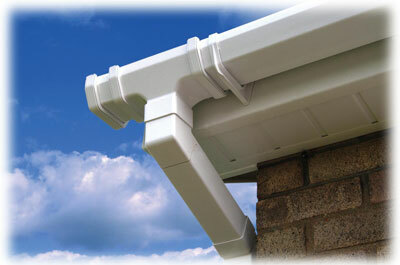 We can replace Guttering, Fascias, Bargeboards and Soffits.